Last week, Adam and I took our 3rd wedding anniversary trip and I surprised Adam with the location! So if you were wondering how that went down, essentially I told him that we were a) taking an anniversary trip and b) he would need to pack "fancy" clothes for dates. It wasn't until the moment we got to the airport and printed our boarding passes that he knew we were going to Las Vegas! He was so stoked! Our first day consisted of taking care of checking in and a little bit of time for relaxing and checking out the hotel. We stayed at Palms Place Suites at the Palms Casino--our Studio Suite was perfect for us! It had a great comfy and soft bed, modern decor, a state-of-the-art kitchen, hardwood floors, a large bathroom with dividers (ps. if you live with your significant other, you understand the importance of having a bathroom divider i.e. keeping the really private stuff private whenever you can--and leaving more to the imagination! ), a dreamy jacuzzi bath, and a waterfall shower. We spent our first day hanging out and watching cable for a bit--really low key! We actually don't have cable or TV at home, so it is always cool to enjoy some television when we are staying overnight somewhere! Adam put on a jacuzzi bubble bath for me and I enjoyed a glass of chilled pinot grigio from the comfort of my personal, oversized bath rub! The next morning, though, we decided to explore the city! We explored Caesar's Palace, The Venetian, and Treasure Island on our first day! Adam and I agree that our favorite casino on "the strip," for many reasons, was The Venetian! The inside of the casino is absolutely stunning and very glamorous! OH and it doesn't hurt Adam won a $225 on a $1 slot his first try! Our favorite food of the week we also got our first full day in Las Vegas at Bacchanal Buffet! ...and our favorite nightclub/lounge was Ghostbar at the Palms Casino! The view from Ghostbar was absolutely surreal! This trendy lounge sits on top of the Palms Casino on the 55th floor of the building. From the second you enter the bar, it is just stunning modern decor everywhere. The lighting is perfect and sets the tone for that Las Vegas atmosphere anyone at any age can enjoy! But the best part of Ghostbar is the outside patio--if you imagine Las Vegas with just endless lights and a beautiful city scape, this is the lounge you need to visit. It was literally perfect. ...see what I mean? Perfect view from Ghostbar's patio at Palms Casino! So the second day, we visited the NYNY, Bellagio, and Excaliber! Our day was packed with lots of sight seeing, some harmless debauchery, and just making memories! The third day we saw Luxor and MGM Grand (our final 2 must-see casinos on the strip), and then we toured both The Mob Museum and The Neon Museum! We wanted to ensure we let every venue know if they treated us well! And I want to take a moment to thank these venues for having us and for helping make our wedding anniversary vacation awesome! @ourminifamily Glad to hear you loved our venue. Nothing beats the view #55FloorsUp! @ourminifamily So glad you enjoyed it! Those special agents accomplished impressive things. Come see us again next time you're in Vegas! We are super sad that our vacation is over, but excited to see what travel plans we have in the future! For live updates of our future travel and vacations, be sure to follow us on Twitter or Instagram! 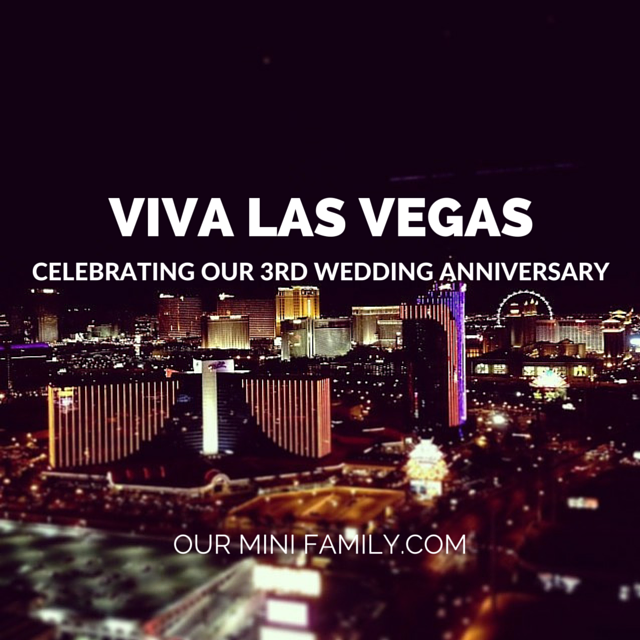 What did you do for your 3rd wedding anniversary? This must have been an amazing time for you both. It looks like an amazing place to stay.You look so cute together. Thanks for sharing. What an awesomely cool vacation trip you had! Congrats your anniversary. Great pictures! I've stayed at the Palms a number of times, including one of the suites once. Loved the rooms every time! They are stunning rooms aren't they?! I couldn't agree more, Scott! Oh.My.Gosh. Your pictures are amazing! The room looks awesome, especially the bathroom! I could live there for sure haha. What a very cool and modern hotel room......and the photos of the lounge and restaurant look amazing. I haven't been to Vegas in years, but this could twist my arm. Yes--definitely very modern and hip! And to be honest, since we went in the summer time and during the week, it wasn't too noisy either. In fact, it was pretty quiet! Which I LOVED! I wanted to give Adam that Vegas experience we all wonder about, without having to deal with drunken hotel goers and such. It was great! One of these days I am going to make it to Las Vegas-I don't gamble but would love to just be there and see it all. I didn't realize they had museums-would definitely want to go see them. Thanks for stopping by to visit. In regards to my pictures I either use my Fugifilm SLR and edit with PicMonkey (which is totally free), or I use my iphone and edit with VSCOcam. It's an awesome free app...I like their filters way more than Instagram, plus they don't cut half your image out. Thanks again for passing by. It was so nice to hear from you. Thank you SO much, Tammy! You are so sweet!